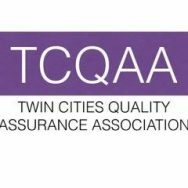 TCQAA is a local Twin Cities non-profit organization dedicated to the proliferation of knowledge of software testing and process. We dedicate ourselves and our resources to the promotion of software testing techniques, tools, processes, and technologies and the advancement of software testing as a profession. Located in the metropolitan area of Minneapolis and St. Paul, Minnesota, TCQAA has been supporting software organizations and information technology professionals since 1986. TCQAA’s vision is to disseminate and promote quality assurance concepts, principles and practices in information technology across all industries.